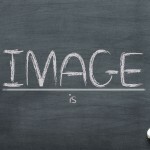 Are you fascinated with fashion and fashion designers? Are you already caught up in the ‘giving spirit’ of the Holidays? 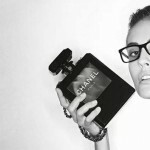 Here’s a little something to get all involved and fashionable at the same time! 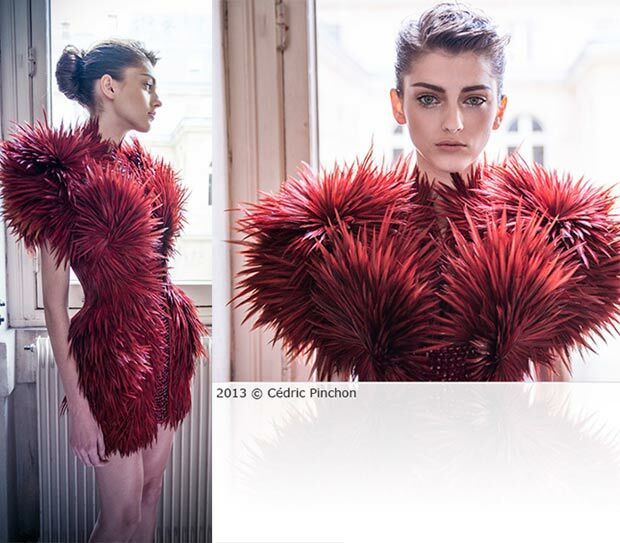 Frimousses de Createurs is a fashion charity project in partnership with UNICEF. 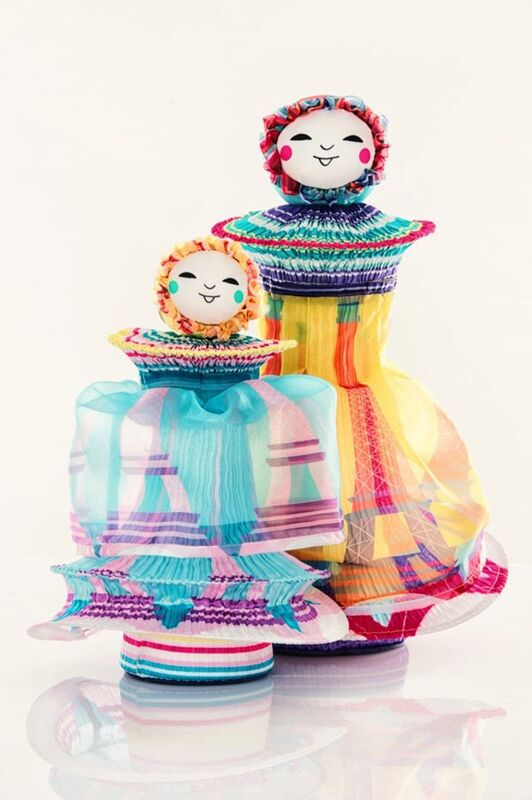 For 11 years, fashion luminaries got crafty for charity, trying to offer their modest help to the children of Darfour. 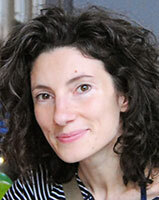 In 2012, 200,000EUR (approximately $271,000 at current exchange rates) have been raised and used to vaccinate the needy. This year, they’re asking for a new record. Let’s see what they have to offer! 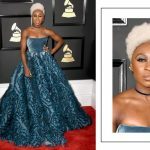 42 ‘Createurs de Mode’ are listed on the official cause website but a couple didn’t submit their work by the time this story has been written (Louis Vuitton and Jerome l’Huillier). 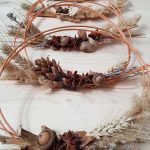 Next to them, the joined efforts of 3 jewelers, 7 designers, 35 contemporary artists will try to raise as much as possible for the humanitarian cause. 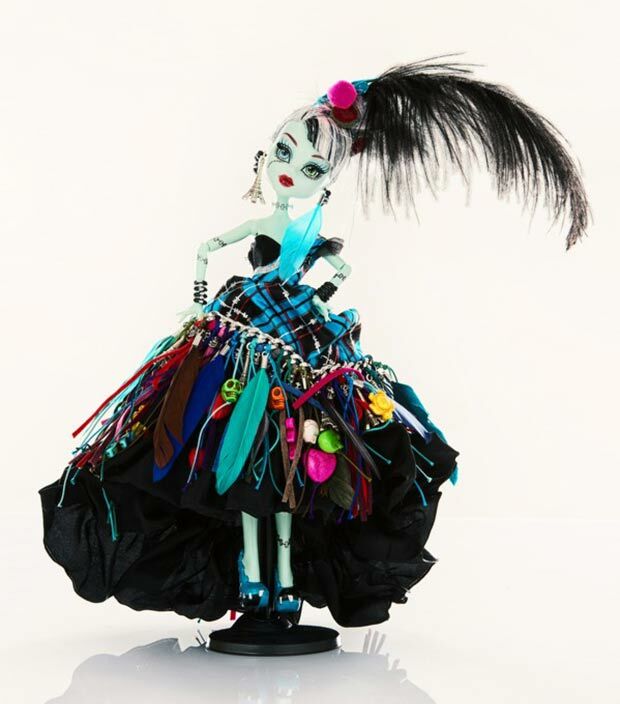 Until the actual charity action takes place (December 2nd 2013 at the Four Seasons Hotel George V in Paris, all the creations are on display on a public exhibition at le Petit Palais, starting November 26 until December 1st 2013, Paris). Among the 42 dolls, I included here 32 for your consideration. 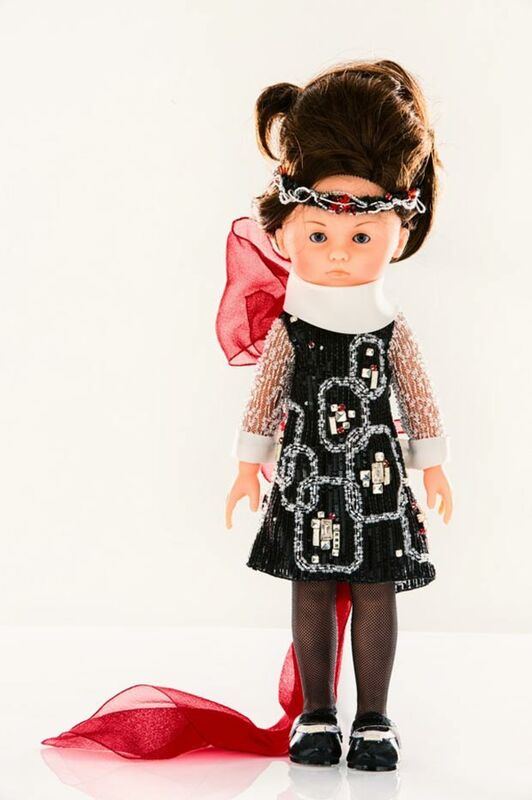 32 Fashion Designers Dolls for the good cause. Some of them are creepy, some of them are endearing. But that’s the designers vision about this year’s Parisian theme. Let’s see them and then pick a favorite and discuss the initiative, should you feel like it! 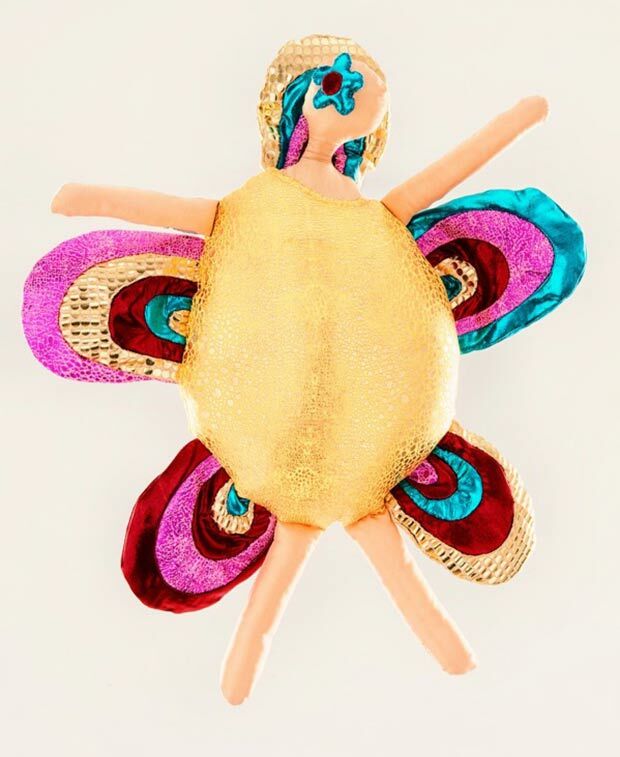 a taffeta and lycra doll with wonderful colors inspired by the lights of Paris. 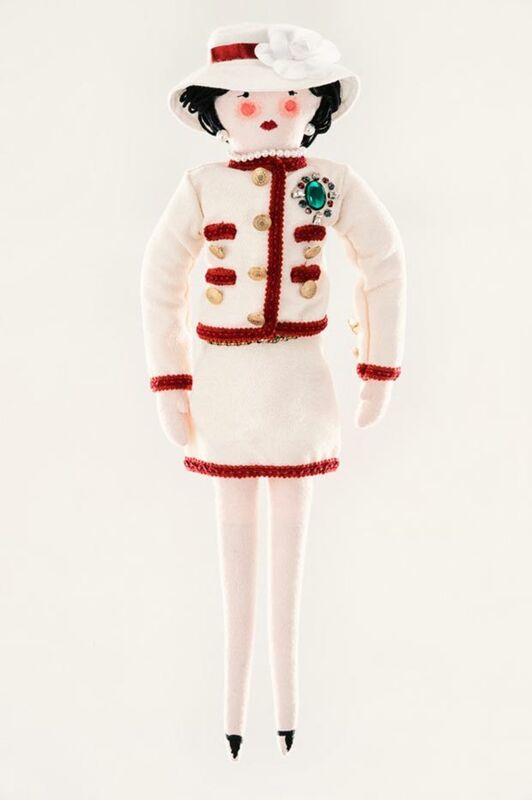 This doll would actually translate successfully as a mass-produced actual toy. 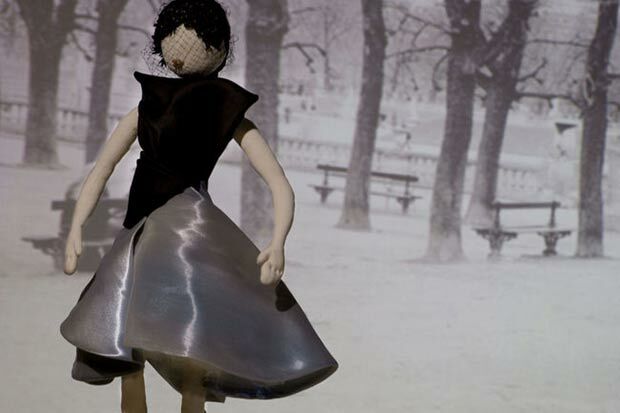 the tulle dressed doll with satin corset and ring matching the pearls pompon on the shoes was inspired by the Tour Eiffel. 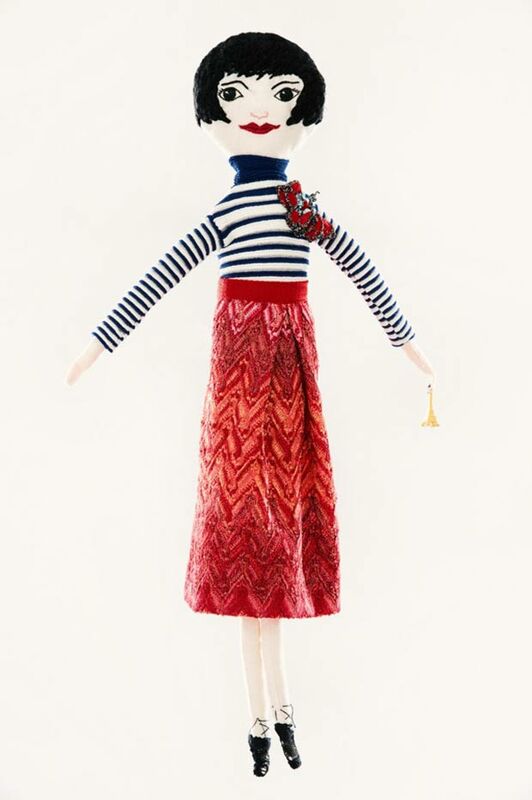 a lovely doll with long, blond hair under a black beret and polka dots scarf looks so chic! 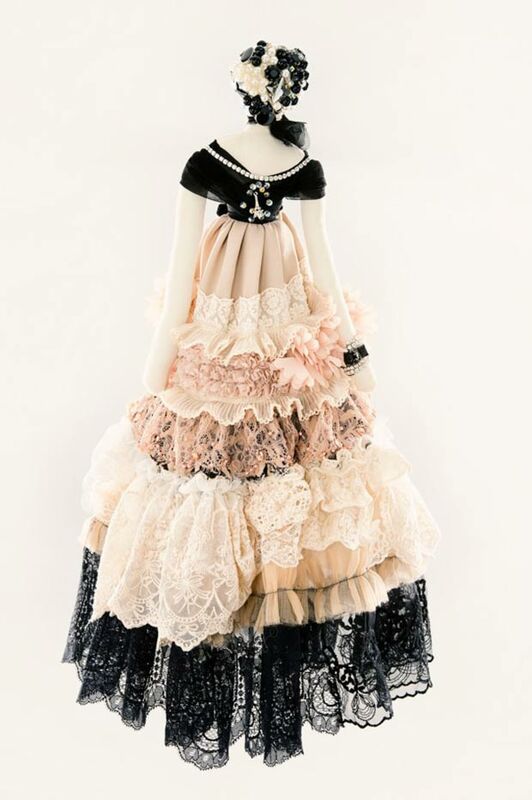 looking like the Tour Eiffel, this doll has a metal body and pink taffetas silk lingerie. Pretty daring but suitable for a lingerie designer. 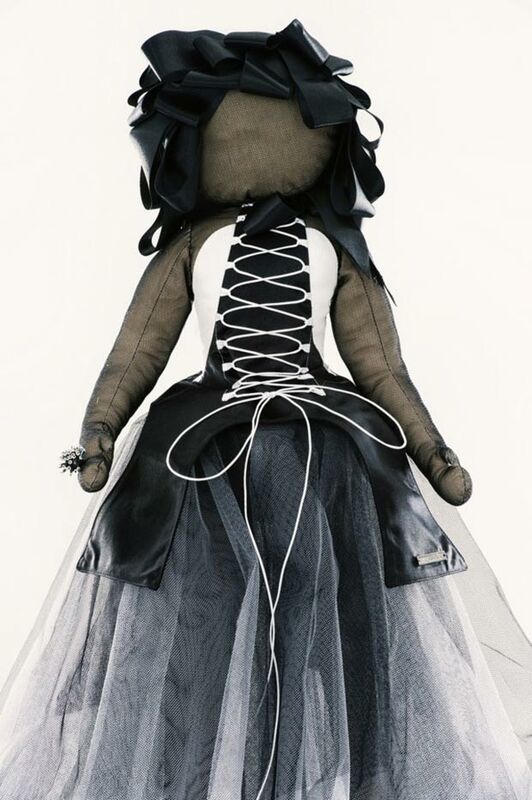 is one of the most couture-ish dolls in the collection. She’s wearing an evening dress and leather flowers in her raven black hair. 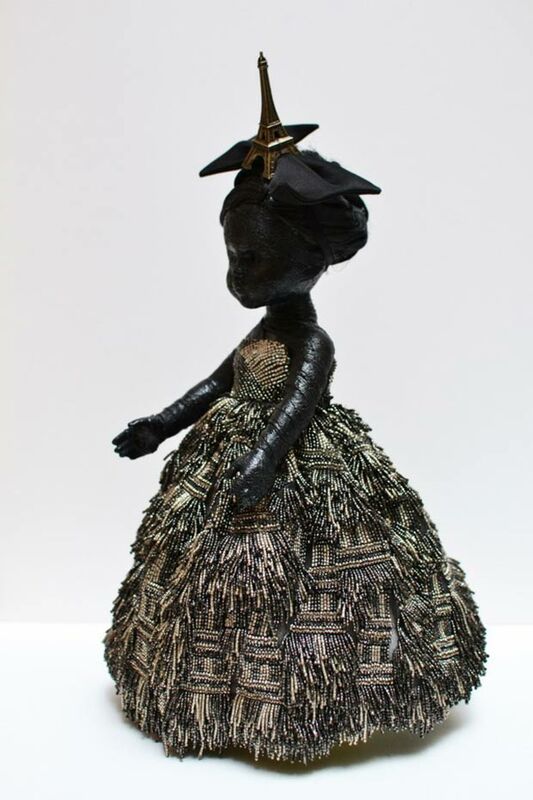 inspired by Josephine Baker, ironically made with a Caucasian Barbie doll body and face (remember Josephine Baker’s surname was ‘la creole’), this is a doll with a bag-skirt made of leather. this is the Parisian fashion silhouette par excellence. Wearing a leather jacket and a lovely printed dress, she has her legs warmed by a pair of knee high socks. 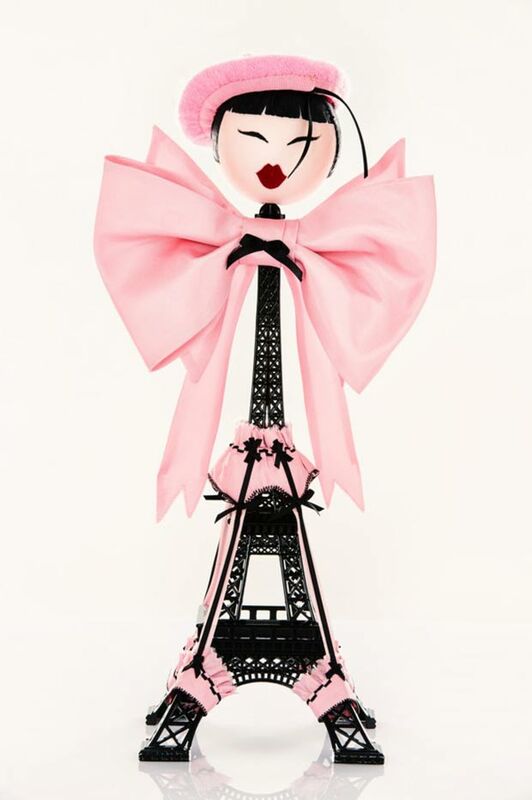 is yet another doll inspired by la Tour Eiffel with an impressive dress embroidered by hand on an organza base. The multitude of hematite and ancient-looking silver make a stunning impression even in the pictures! 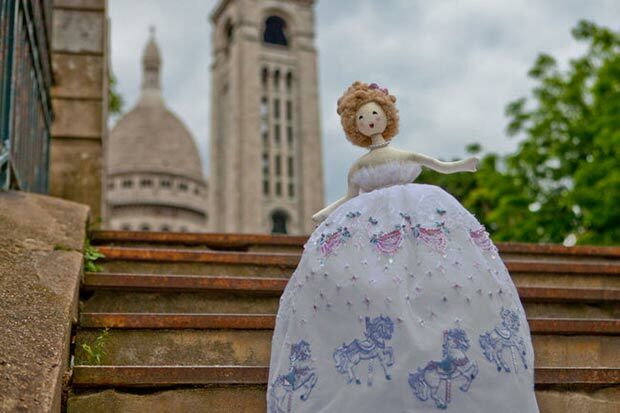 brings back a piece of charming history with her French lace and silk dress and Swarowski decorations inspired by the lights of Paris. 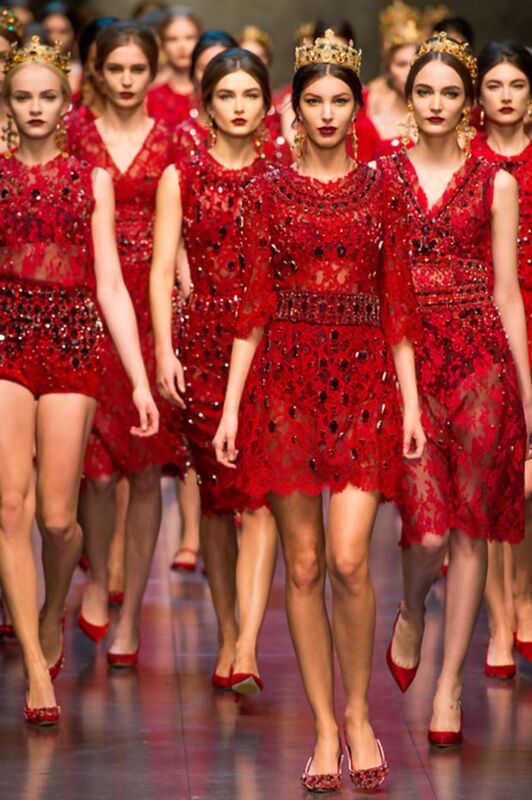 for some reason, the Italian designers reduced one of their catwalk models to a doll stature and dressed her in a red lace with red crystal stones. Then they attached a fancy explanation to it, saying that: ‘only by knowing your past and traditions, can you build your future’. Got it? 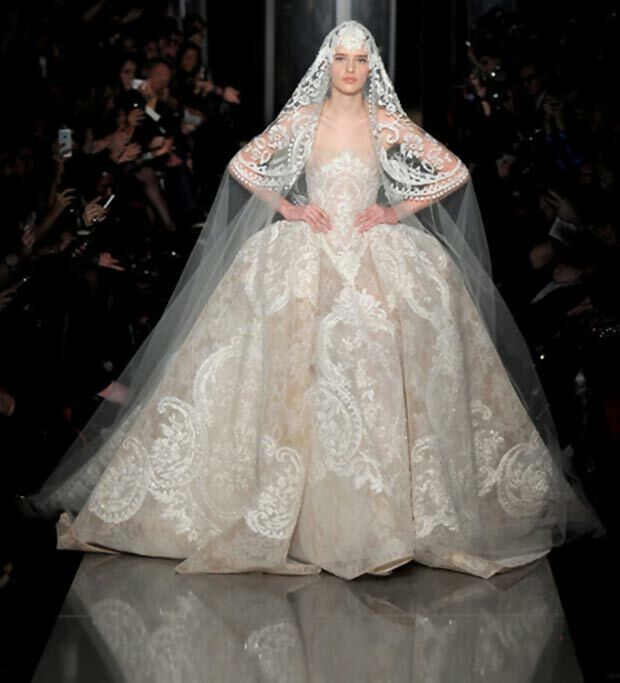 was inspired by the Haute Couture Spring Summer 2013 collection of the designer (at least he’s plain open about it, unlike Domenico and Stefano above). A beautiful, delicate wedding-like dress with crinoline in white lace. The floral embroidery was made with silk thread. 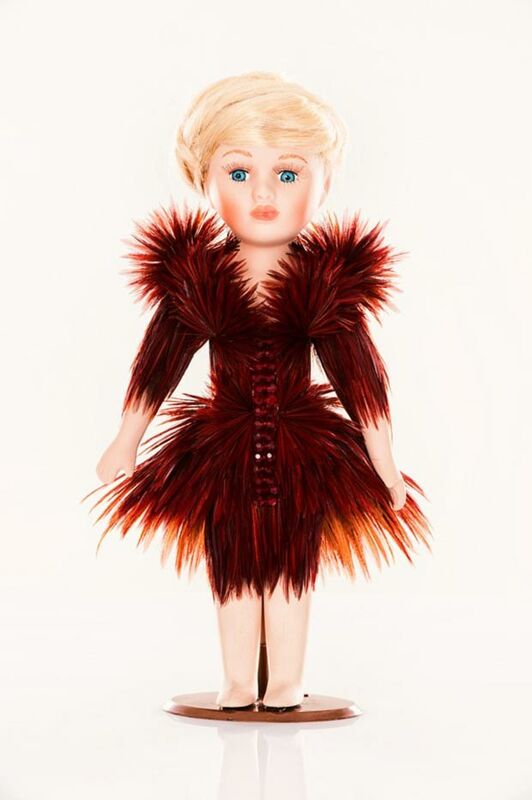 another doll inspired by the catwalk presentation. 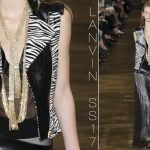 This time it’s the fall winter 2013 collection as Peter Dundas’s doll is wearing a beaded t shirt with otto print, high cuissard boots and a zebra belt. 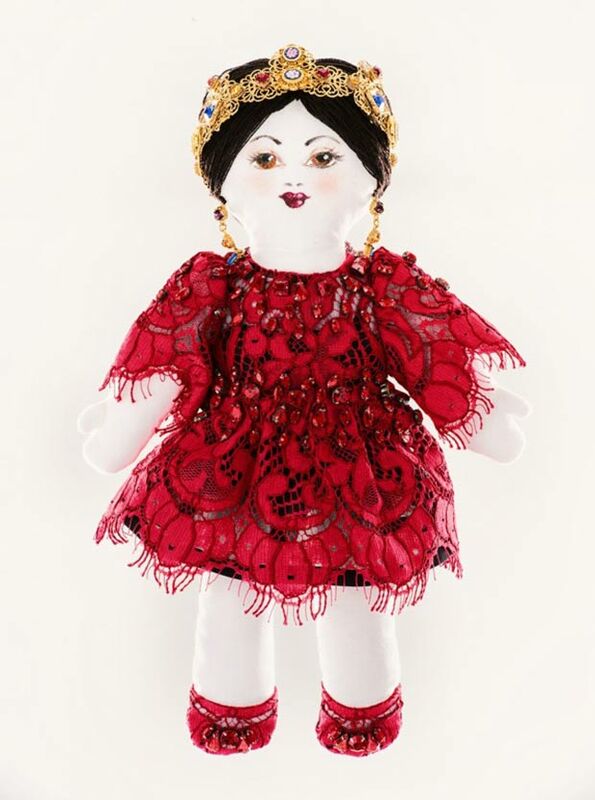 embroidered with silk thread, pearls and crystals, Georges Hobeika’s doll looks like Marie Antoinette. 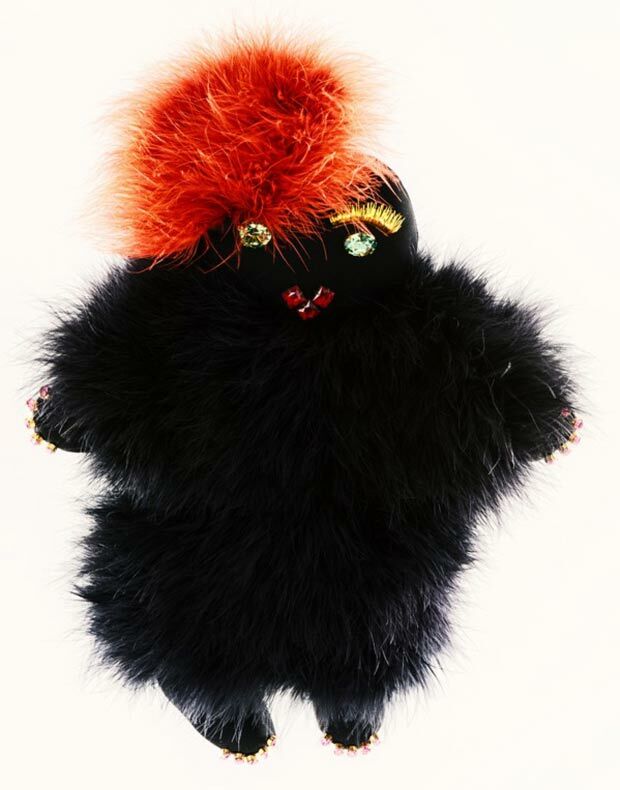 while I’m still trying to figure out the doll’s name (which literally means Lili Dog Skin), I can’t help but admire the ‘rock en roll’ approach of this creation. Doesn’t she look joyful and happy? adding a beret and a scarf around the neck, a Tour Eiffel print or accessory is enough to relate to the Parisian charm. Gucci’s heart print wardrobe for little Charlotte is charming, though. these are definitely my favorite dolls from the lot. They’re smiling, looking happy, they’re wearing bright outfits. They’re two ‘young Japanese friends who venture in discovering Paris’. 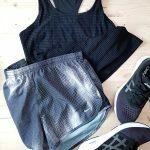 Feisty little fashion things! 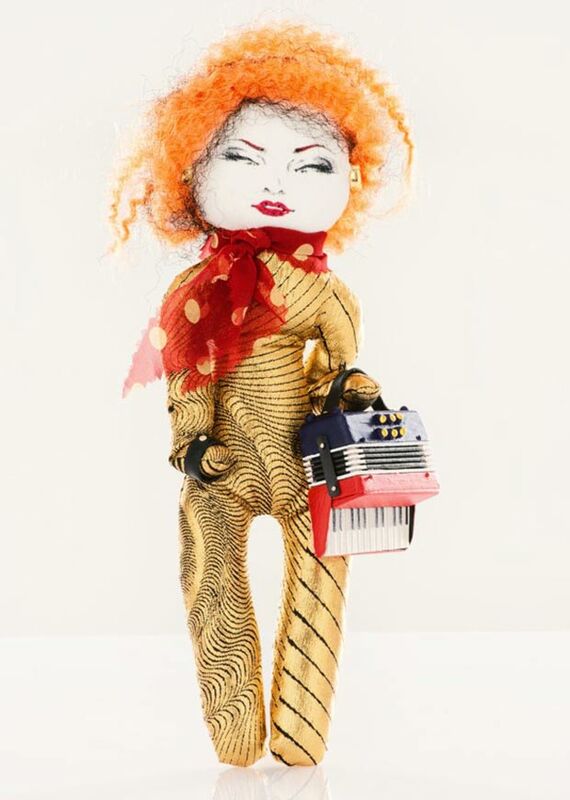 while I was expecting a bit more from a French designer (clothing-wise), I’ll have to settle for the idea: a musician doll with an accordion and a polka dots scarf! And oh, that red hair! Show-gorgeous! 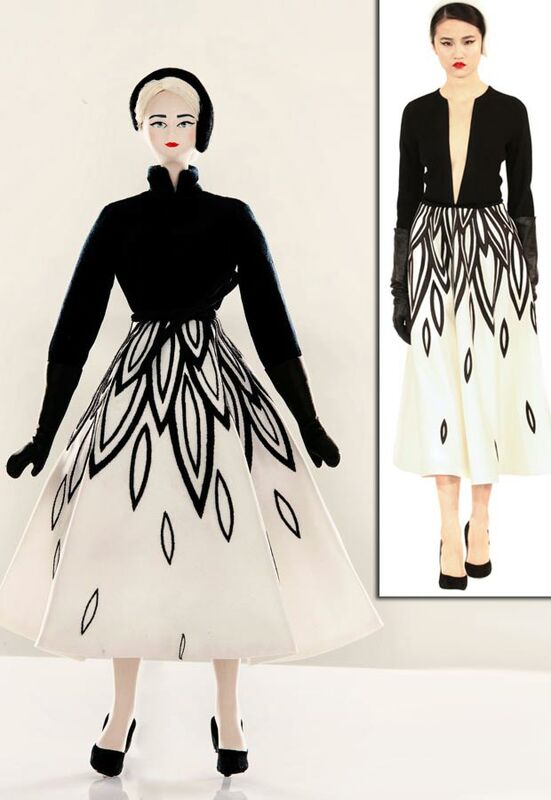 this is something Tilda Swinton would wear – actually, this looks like Tilda, doesn’t it? 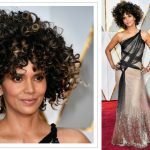 All dressed up in leather and Swarovski crystals! 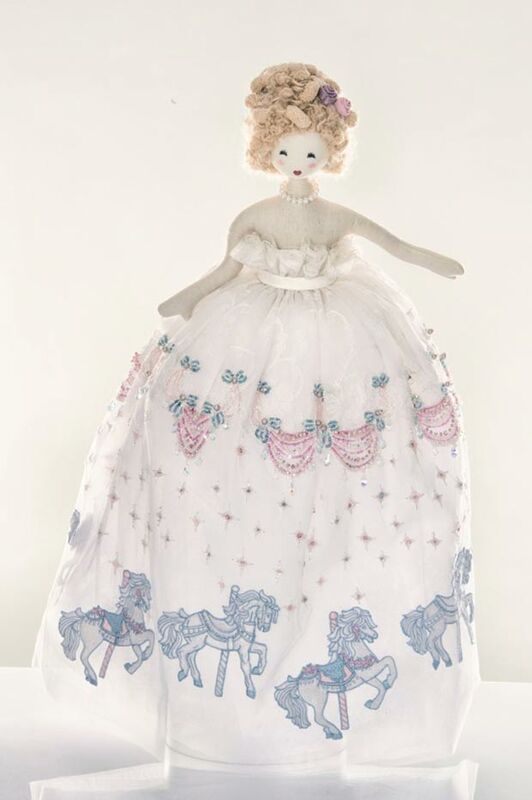 a handmade effervescence with embroideries and pearls, pink roses covered dress, Edith is a coquette who ‘hates the word cool but loves the word love’. And shopping, I might add! 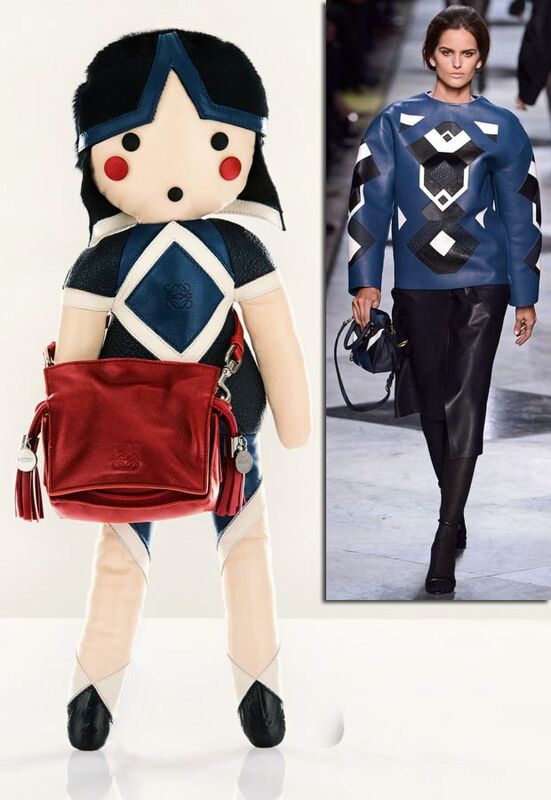 proudly wears her Flamenco leather bag and her patchwork outfit. 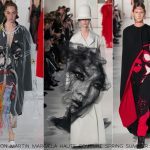 this is a complex work of fashion and art inspired by both a movie – Buñuel’s Belle de Jour (from 1967, the film stars are Catherine Deneive and Jean Sorrel) and a Parisian landmark: the Place Vendôme. 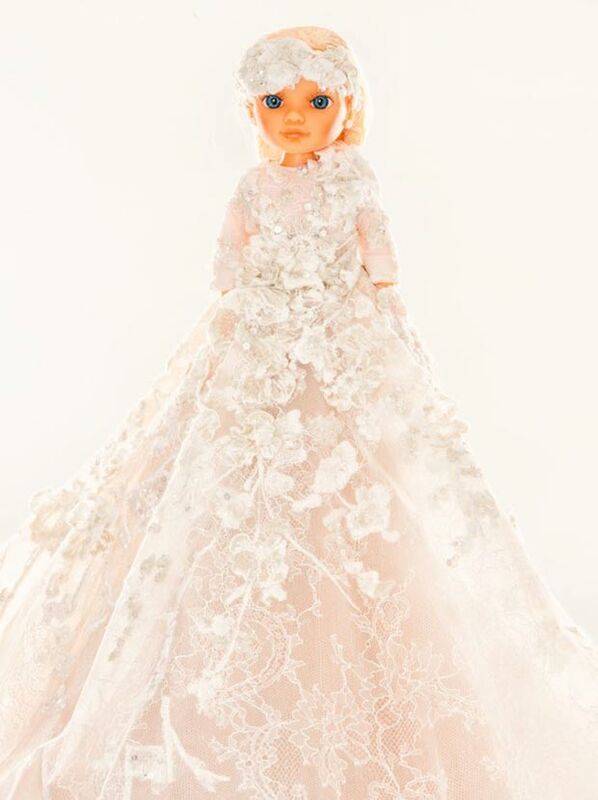 the delicate creation made of porcelain is wearing a bride dress Haute Couture Max Chaoul. 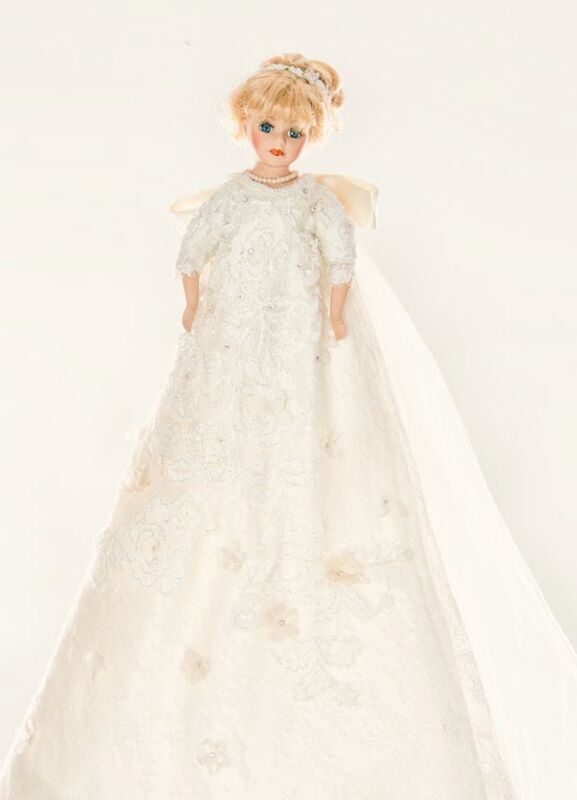 The designer is creating for the cause since its beginnings so he wanted to mark this special occasion with a special doll (although porcelain/china relates to a wedding’s either 2nd or 18th anniversaries). 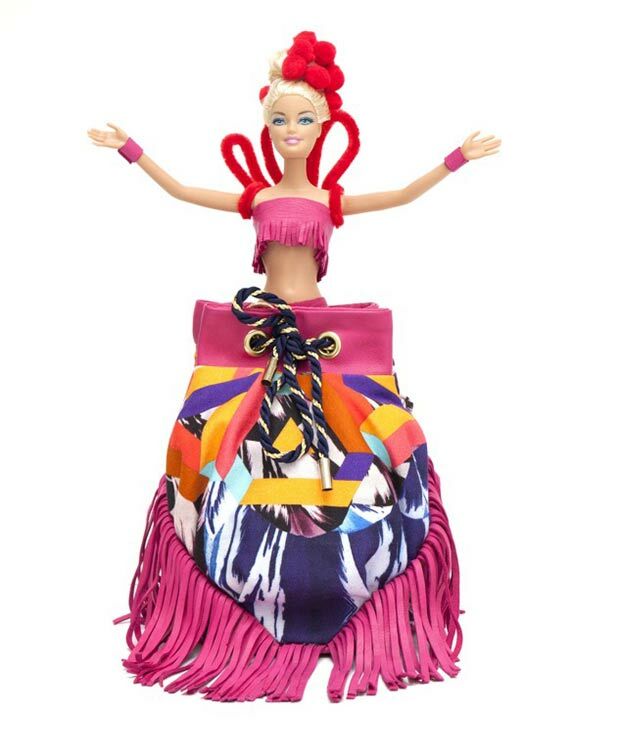 what a charming inspiration for a lovely, happy doll! 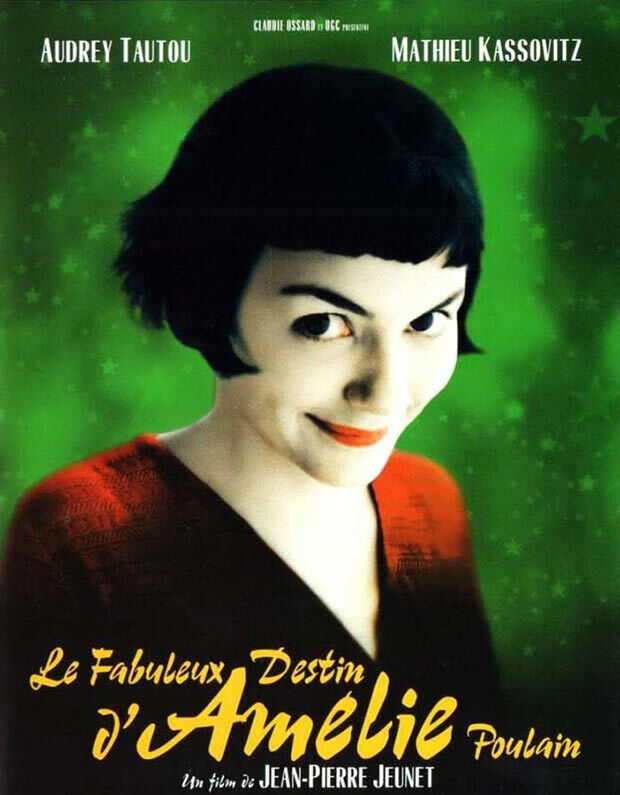 The designer was inspired by the fabulous world of Amelie who was, coincidentally, all about ‘doing good to those we don’t know’. 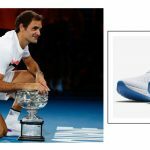 Very suitable! 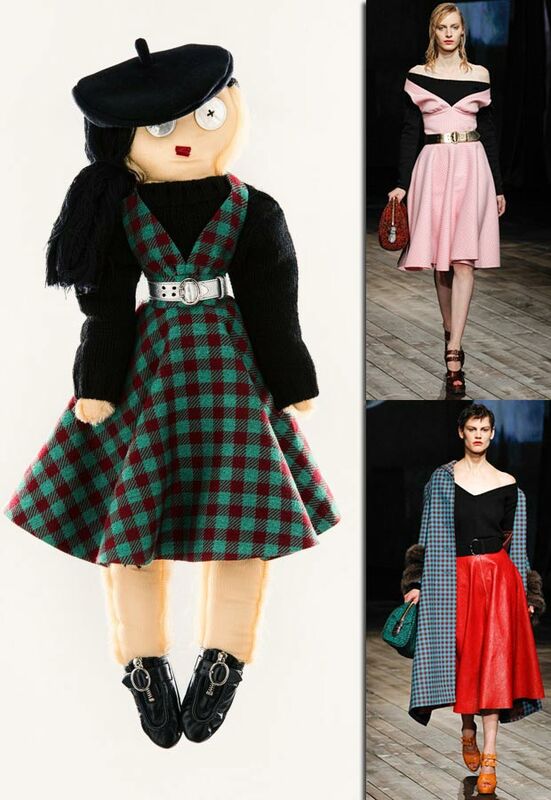 is a catwalk doll, wearing an outfit from the Fall Winter 2013 Miu Miu collection. a little aristocrat with her vinyl cape with precious fur looking more a Russian princess than a chic Parisian girl. 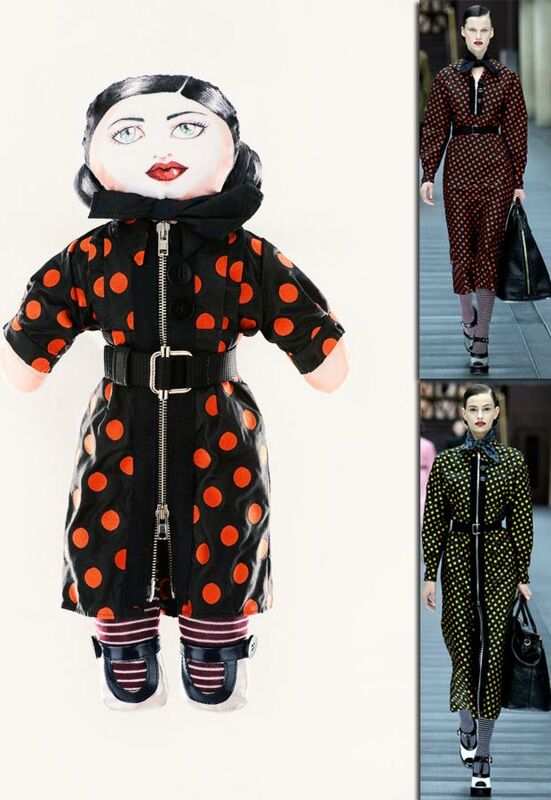 just like her little Miu Miu Rhianna sister, Julia is also wearing a look from the catwalk, the fall winter 2013 Prada collection. 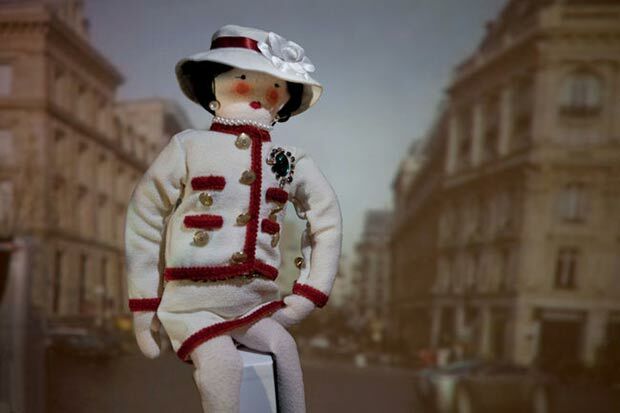 Button eyes and French details – the noir beret, the red lips – make this wee one a Parisian! 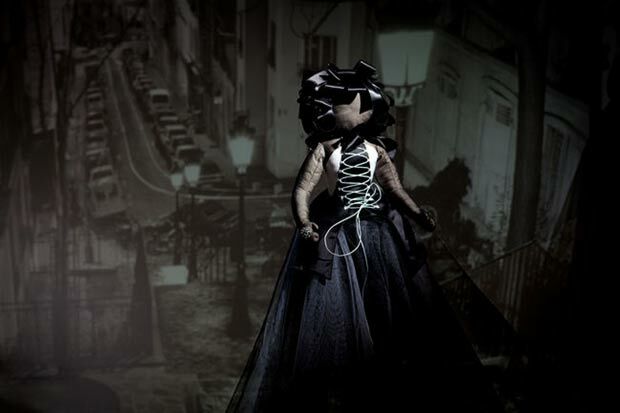 although you’d be incline to believe the name and the look reference Josephine Baker, thus making the Coco&Forget Me Not wrongs right again, the doll dressed all in black looks pretty dull for the ‘crazy Parisian nights’! 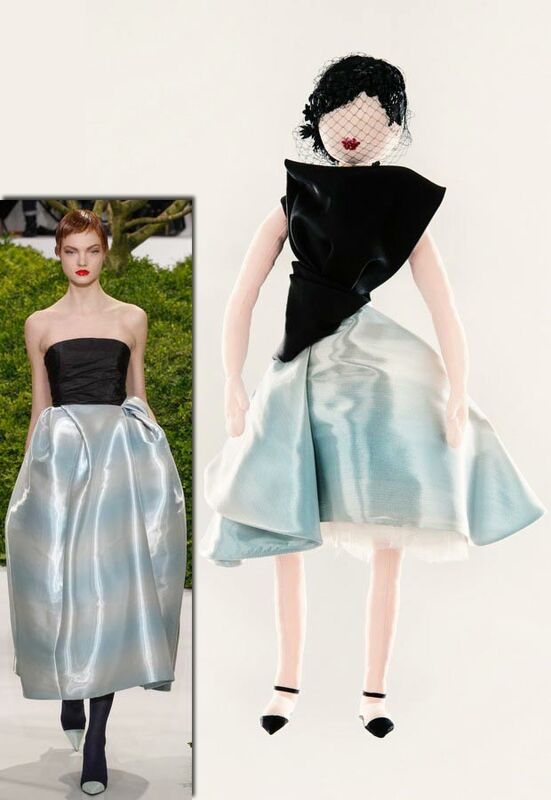 a porcelain doll with a catwalk replica from the Haute Couture fall winter 2013 collection, as worn by Alexandra Ruda Kova. this looks crazy. But crazy good. 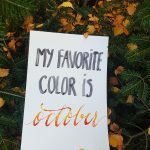 With silk, marabou and rhinestones! 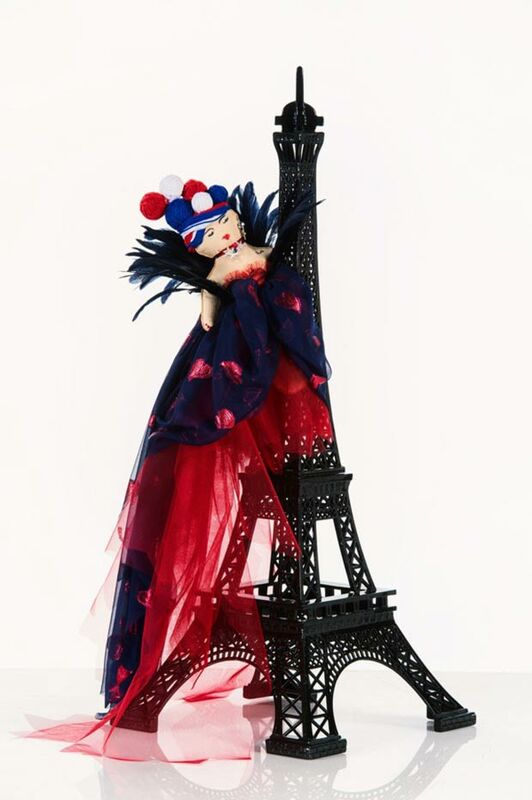 wearing metallic leather, feathers and silk and climbing a metal Eiffel Tower makes just the right Fashion sense it should! For this doll is a fairy. 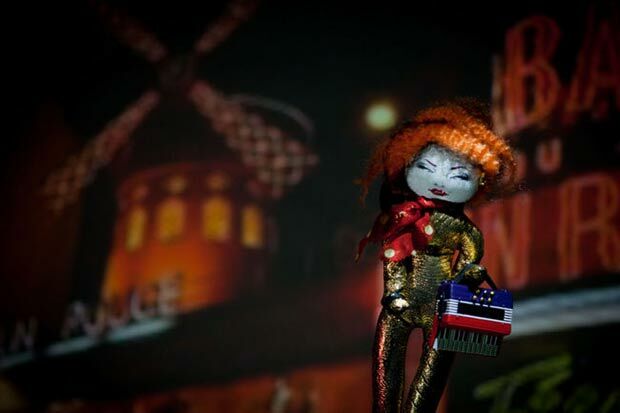 The Parisian fairy spreading the magic of the City of Lights. a classic. Velvet and silk come together in a graphic combination to sustain the good Unicef cause.